the popularity he enjoyed as a foremost illustrator of "Tarzan"
for the Sunday "Funnies" from 1937-1949. Bibliography and Biography: Includes standard reference sources, and works by Heins. Porges. Lupof. l.acassin, Fenton. Day, Harwood. Ciunn. 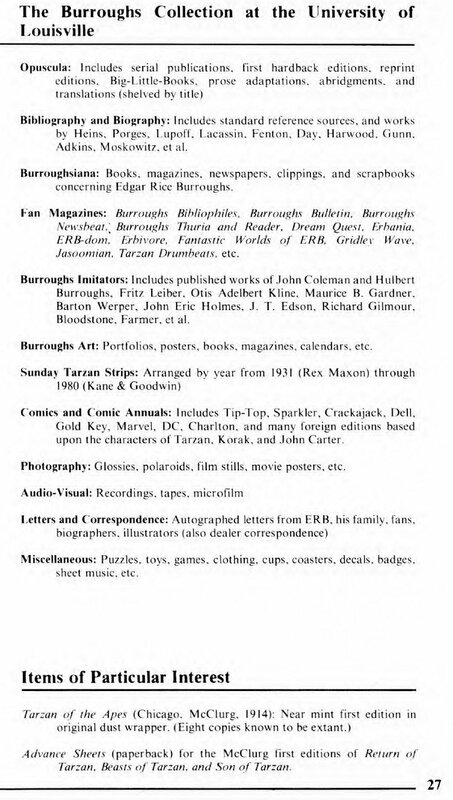 Burroughsiana: Books, magazines, newspapers, clippings, and scrapbooks concerning Fdgar Rice Burroughs. 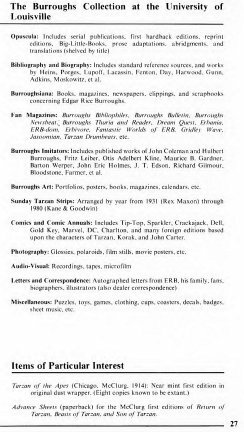 Fan Magazines: Burroughs Bibliophiles, Burroughs Bulletin, Burroughs Newsbeat, Burroughs Thuria and Reader, Dream Quest, Erhania, ERB-dom, Erhivore, Fantastic Worlds of E.RB, Gridley Wave, Jasoomian, Tarzan Drumbeats, etc. Burroughs Imitators: Includes published works of John Coleman and Hulbert Burroughs. Fritz Leiber. Otis Adelbert Kline. Maurice B. Gardner, Barton Werper. John Eric Holmes. J. T. Fdson. Richard Gilmour, Bloodstone. Farmer, et al. Burroughs Art: Portfolios, posters, books, magazines, calendars, etc. Comics and Comic Annuals: Includes Tip-Top, Sparkler, Crackajack, Dell, Gold Key, Marvel. DC, Charlton, and many foreign editions based upon the characters of Tarzan. Korak. and John Carter. Photography: Glossies, polaroids, film stills, movie posters, etc. Miscellaneous: Puzzles, toys, games, clothing, cups, coasters, decals. badges, sheet music, etc. Advance Sheets (paperback) for the McClurg first editions of Return of Tarzan. Beasts of Tarzan, and Son of Tarzan. First Norwegian edition of Burroughs' first novel. Original title: Under the Moons of Mars. 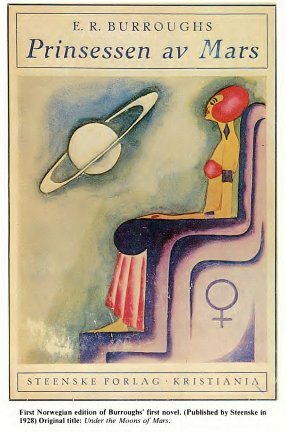 "Under the Moons of Mars" (All-Story Magazine, February-July. 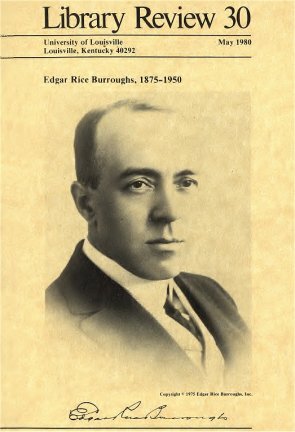 1912): The first published story of Edgar Rice Burroughs, written under the pseudonym of "Norman Bean" (published in hardcopy as A Princess of Mars). 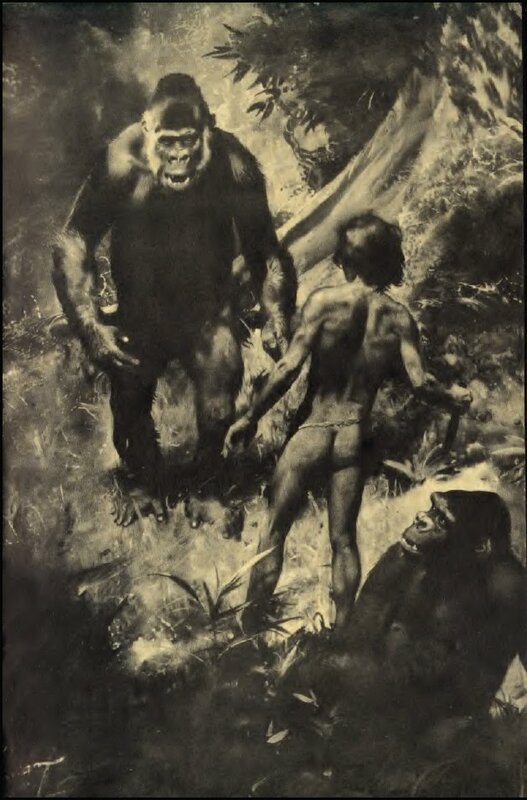 The Tarzan Twins (Joliet, 111., Volland, 1927): Dedicated by ERB to his three children and autographed by them on dedication page. Tarzan Der Deutschenfresser (Berlin. Stephenson. 1925) by Stefan Sorel: Bitter attack on Burroughs' anti-German sentiments in Tarzan the Untamed. Attractive foreign editions in French. German. Italian. Spanish. Portuguese, Dutch, Swedish, Greek. Polish, Hungarian. Czech. Yugoslav, Icelandic, Finnish, Turkish, Arabic. Norwegian. Vietnamese. Chinese, Japanese, Hebrew, Esperanto, etc. Complete serial runs, first editions, Sundav Tarzans. 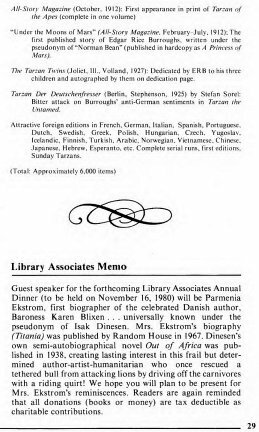 Guest speaker for the forthcoming Library Associates Annual Dinner (to be held on November 16, 1980) will be Parmenia Ekstrom, first biographer of the celebrated Danish author, Baroness Karen Blixen . . . universally known under the pseudonym of Isak Dinesen. 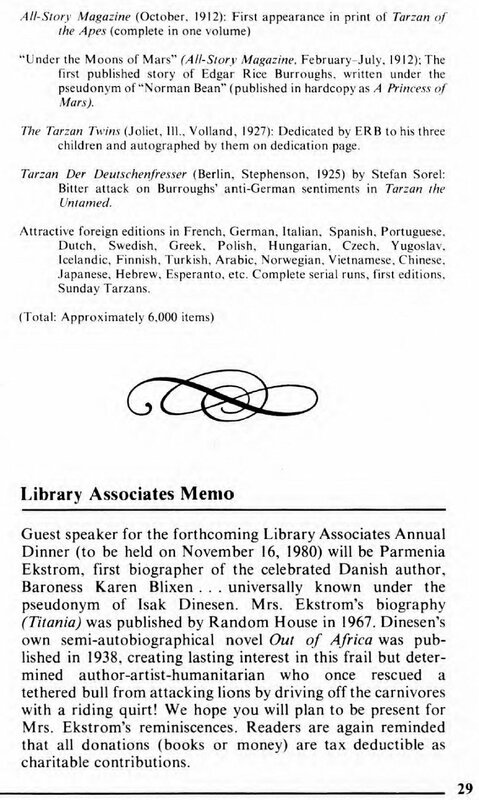 Mrs. Ekstrom's biography (Titania) was published by Random House in 1967. Dinesen's own semi-autobiographical novel Out of Africa was published in 1938. creating lasting interest in this frail but determined author-artist-humanitarian who once rescued a tethered bull from attacking lions by driving off the carnivores with a riding quirt! We hope you will plan to be present for Mrs. Ekstrom's reminiscences. Readers are again reminded that all donations (books or money) are tax deductible as charitable contributions. EKAOTIKOZ OIKO£ flETPOY A HMI1 TP AKO v a.E. although Liana of Gathol was illustrated by John Coleman Burroughs. 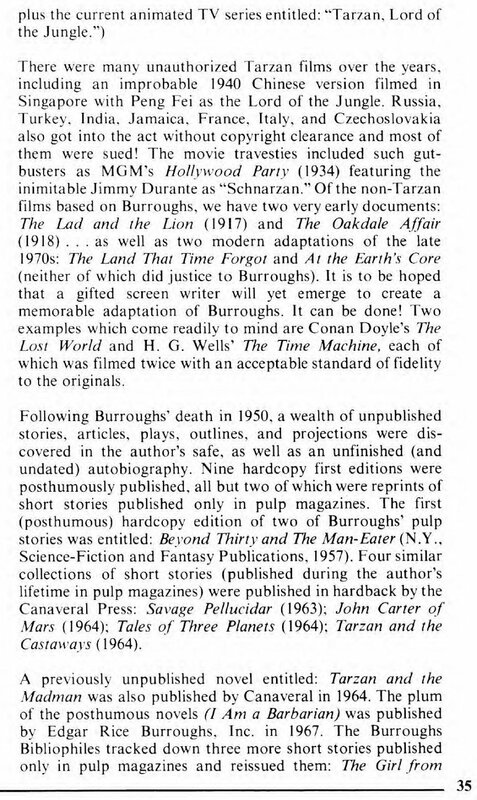 The Burroughs canon contains seventy-one first hardcopy editions issued by eight different publishers: McClurg, Metropolitan, Macaulay, ERB, Volland, Whitman, House of Greystoke, and Canaveral . . . with Ace (paperback) included as a true "first." Looking behind the scenes, we discover many shorter pieces to have been collected for one published edition. Thus, the canon of ninetv-nine titles can be whittled down to seventy-one. English reprints were through Burt and G&D, ERB, Canaveral, Dover, Doubleday, and a host of paperbacks. Thirty-one stories, some of book length, remain unpublished. 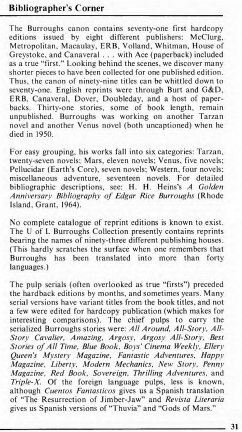 Burroughs was working on another Tarzan novel and another Venus novel (both uncaptioned) when he died in 1950. For easy grouping, his works fall into six categories: Tarzan, twenty-seven novels; Mars, eleven novels; Venus, five novels; Pellucidar (Earth's Core), seven novels; Western, four novels; miscellaneous adventure, seventeen novels. 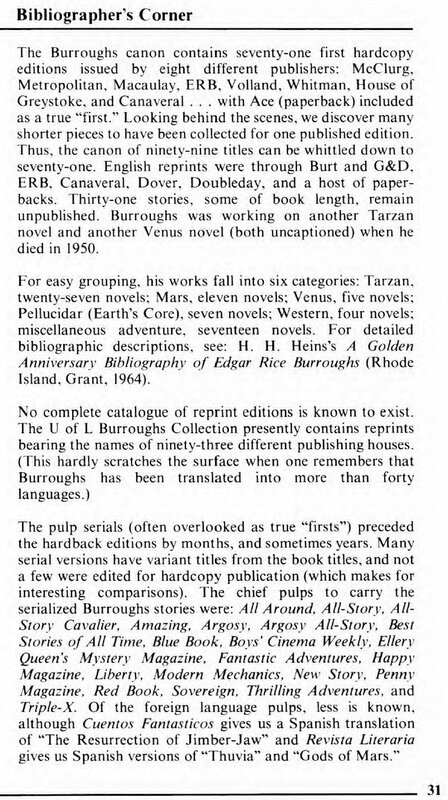 For detailed bibliographic descriptions, see: H. H. Heins's A Golden Anniversary Bibliography of Edgar Rice Burroughs (Rhode Island, Grant, 1964). The pulp serials (often overlooked as true "firsts") preceded the hardback editions by months, and sometimes years. Many serial versions have variant titles from the book titles, and not a few were edited for hardcopy publication (which makes for interesting comparisons). The chief pulps to carry the serialized Burroughs stories were: All Around, All-Story, All-Story Cavalier, Amazing, Argosy, Argosy All-Story, Best Stories of All Time, Blue Book, Boys' Cinema Weekly, Ellery Queen's Mystery Magazine, Fantastic Adventures, Happy Magazine, Liberty, Modern Mechanics, New Story, Penny Magazine, Red Book, Sovereign, Thrilling Adventures, and Triple-X. 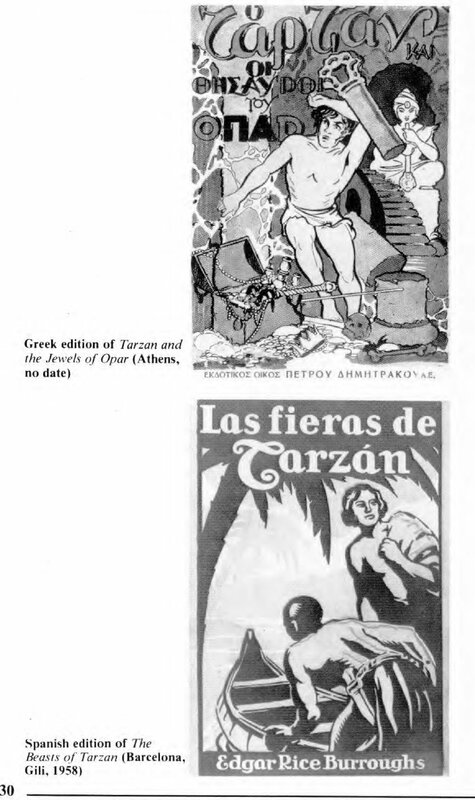 Of the foreign language pulps, less is known, although Cuentos Fantasticos gives us a Spanish translation of "The Resurrection of Jimber-Jaw" and Revista Literaria gives us Spanish versions of "Thuvia" and "Gods of Mars." under the title: Llana of Gathol. and Danton Burroughs in 1945.
and personally witnessed the attack on Pearl Harbor. 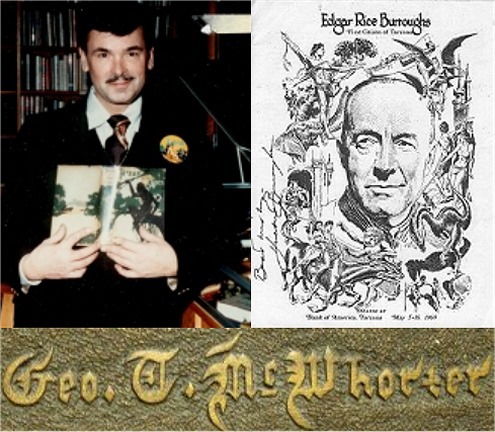 is current president of Edgar Rice Burroughs, Inc. 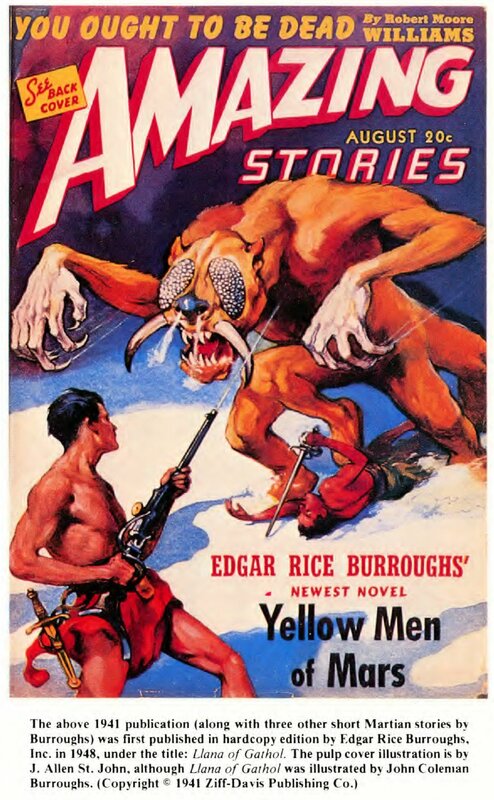 Stories by Burroughs' two sons appeared in Thrilling Wonder, Thrilling Mystery, and Startling Stories. 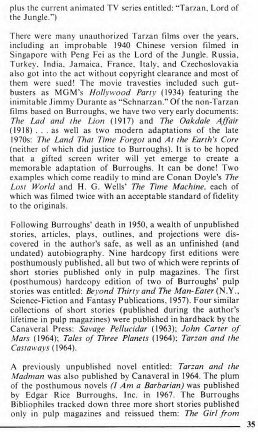 Articles about Burroughs may be found in such pulps as All-Story, Amazing, Analog, Argosy, Blue Book, Other Worlds, Satellite, and others. Eighteen artists are represented in the first hardcopy editions as illustrators for the dust wrappers, the books themselves, or both. 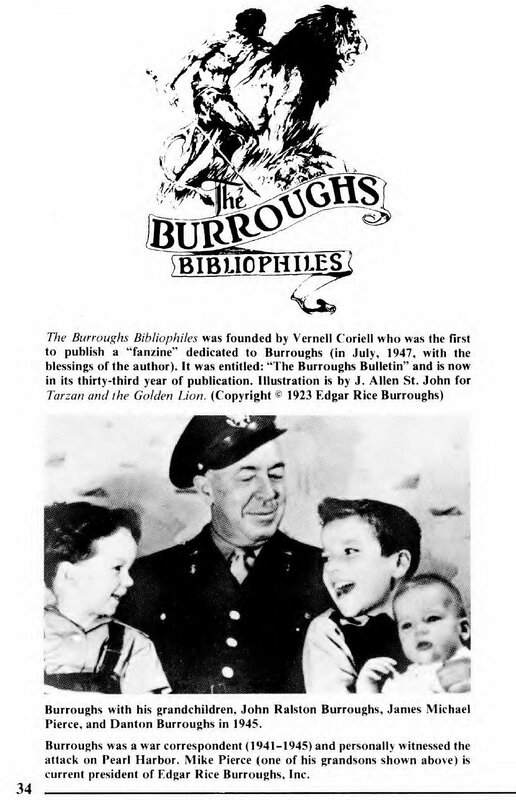 Almost half of the first hardcopy editions (thirty-three titles) were illustrated by J. Allen St. John whom Burroughs greatly admired. John Coleman Burroughs (the author's son) is responsible for eleven first editions. 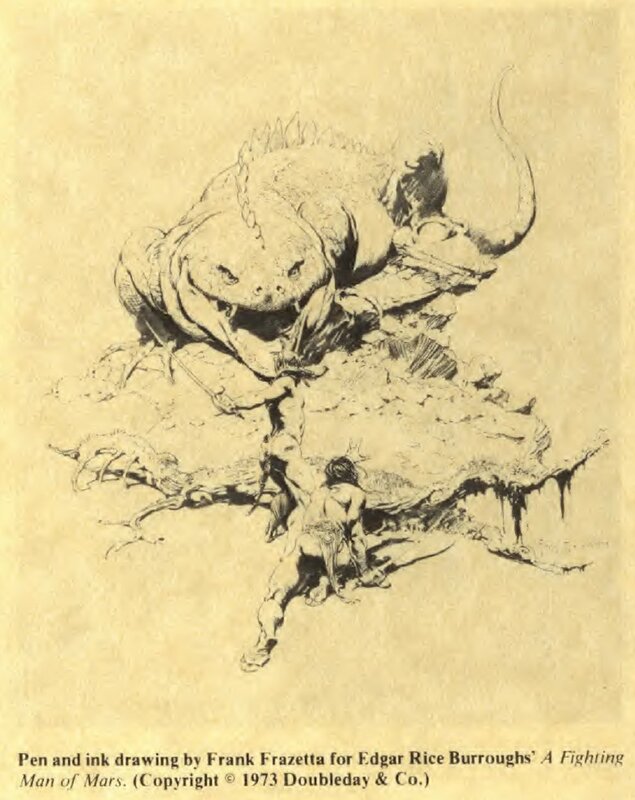 Other artists included Studley O. Burroughs, N. C. Wyeth, Fred Arting (whose famous silhouette for Tarzan of the Apes is often reproduced in bookplates, stationery, fanzine logos, etc. 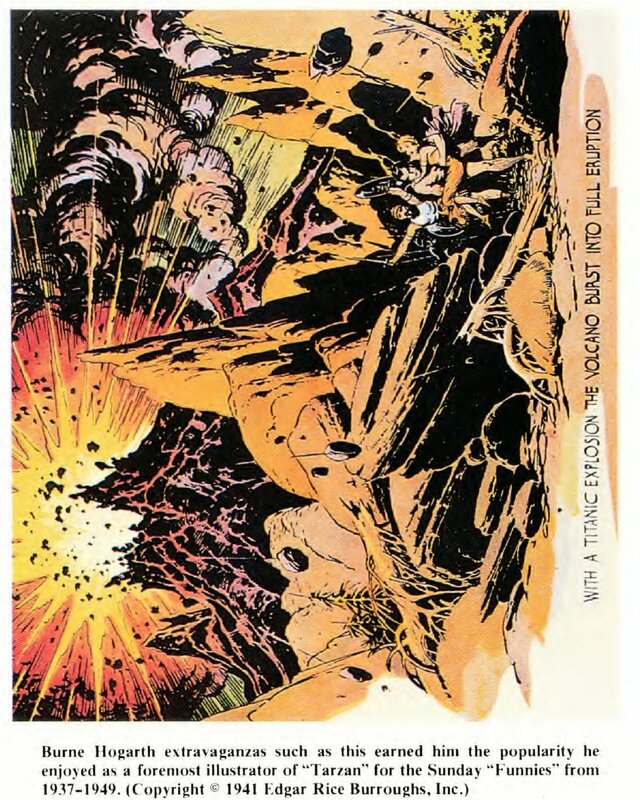 ), Frank Schoonover, P. J. Monahan, Modest Stein, Paul Stahr, Douglas Grant, A. W. Sperry, Hugh Hutton, Juanita Bennett, Paul F. Berdanier, Roy Krenkel, Reed Crandall, Jeff Jones, and Frank Frazetta. 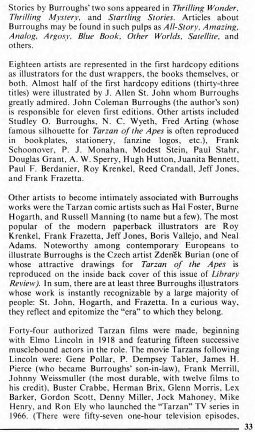 Other artists to become intimately associated with Burroughs works were the Tarzan comic artists such as Hal Foster, Burne Hogarth, and Russell Manning (to name but a few). The most popular of the modern paperback illustrators are Roy Krenkel, Frank Frazetta, Jeff Jones, Boris Vallejo, and Neal Adams. 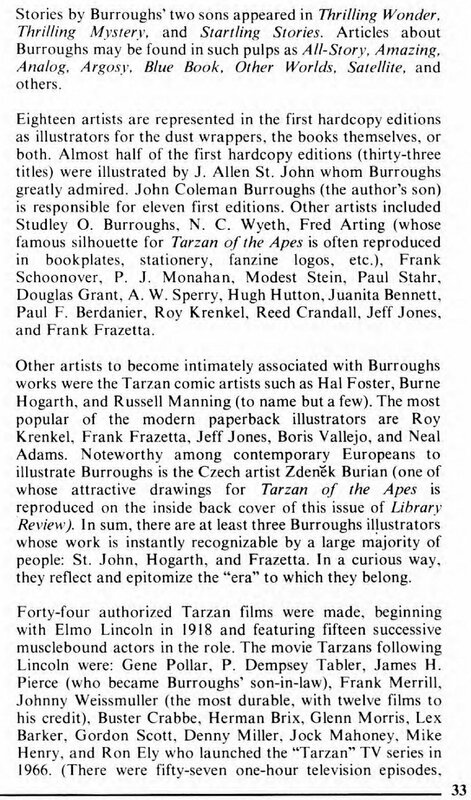 Noteworthy among contemporary Europeans to illustrate Burroughs is the Czech artist Zdenek Burian (one of whose attractive drawings for Tarzan of the Apes is reproduced on the inside back cover of this issue of Library Review). 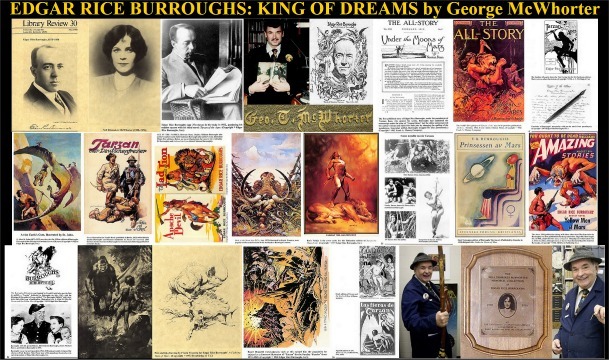 In sum, there are at least three Burroughs illustrators whose work is instantly recognizable by a large majority of people: St. John, Hogarth, and Frazetta. In a curious way, they reflect and epitomize the "era" to which they belong. Forty-four authorized Tarzan films were made, beginning with Elmo Lincoln in 1918 and featuring fifteen successive musclebound actors in the role. The movie Tarzans following Lincoln were: Gene Pollar, P. Dempsey Tabler, James H. Pierce (who became Burroughs' son-in-law). Frank Merrill. Johnny Weissmuller (the most durable, with twelve films to his credit). Buster Crabbe. Herman Brix, Glenn Morris, Lex Barker, Gordon Scott, Denny Miller, Jock Mahoney. Mike Henry, and Ron Elv who launched the "Tarzan" TV series in 1966. (There were fifty-seven one-hour television episodes. There were many unauthorized Tarzan films over the years, including an improbable 1940 Chinese version filmed in Singapore with Peng Fei as the Lord of the Jungle. Russia, Turkey, India, Jamaica, France, Italy, and Czechoslovakia also got into the act without copyright clearance and most of them were sued! The movie travesties included such gutbusters as MGM's Hollywood Party (1934) featuring the inimitable Jimmv Durante as "Schnarzan." 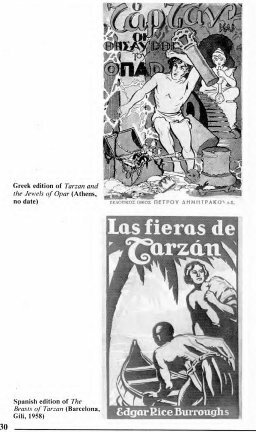 Of the non-Tarzan films based on Burroughs, we have two very early documents: The Lad and the Lion (1917) and The Oakdale Affair (1918) . . . as well as two modern adaptations of the late 1970s: The Land That Time Forgot and At the Earth's Core (neither of which did justice to Burroughs). It is to be hoped that a gifted screen writer will yet emerge to create a memorable adaptation of Burroughs. It can be done! Two examples which come readily to mind are Conan Doyle's The Lost World and H. G. Wells' The Time Machine, each of which was filmed twice with an acceptable standard of fidelity to the originals. Following Burroughs' death in 1950, a wealth of unpublished stories, articles, plays, outlines, and projections were discovered in the author's safe, as well as an unfinished (and undated) autobiography. 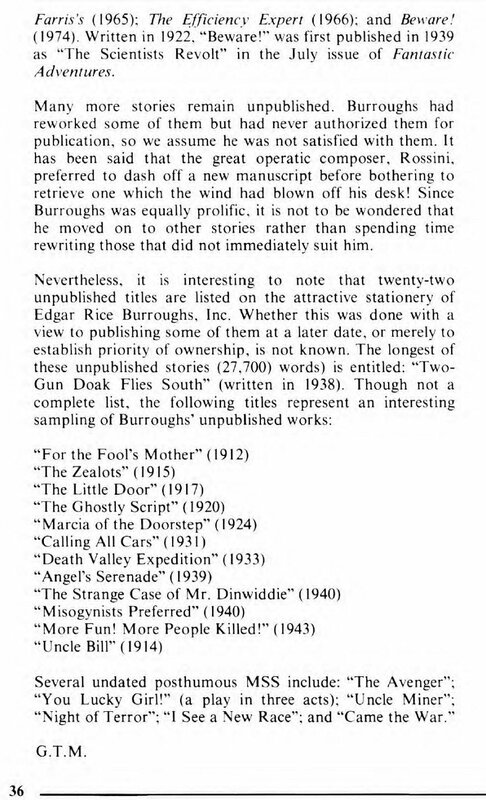 Nine hardcopy first editions were posthumously published, all but two of which were reprints of short stories published only in pulp magazines. The first (posthumous) hardcopy edition of two of Burroughs' pulp stories was entitled: Beyond Thirty and The Man- Eater (N.Y., Science-Fiction and Fantasy Publications, 1957). Four similar collections of short stories (published during the author's lifetime in pulp magazines) were published in hardback by the Canaveral Press: Savage Pellucidar (1963); John Carter of Mars (1964); Tales of Three Planets (1964); Tarzan and the Castaways (1964). Farris's (1965); The Efficiency Expert (1966); and Beware! (1974). Written in 1922, "Beware !" was first published in 1939 as "The Scientists Revolt" in the July issue of Fantastic Adventures. Many more stories remain unpublished. Burroughs had reworked some of them but had never authorized them for publication, so we assume he was not satisfied with them. It has been said that the great operatic composer, Rossini, preferred to dash off a new manuscript before bothering to retrieve one which the wind had blown off his desk! Since Burroughs was equally prolific, it is not to be wondered that he moved on to other stories rather than spending time rewriting those that did not immediately suit him. 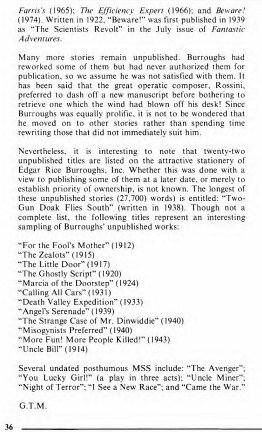 Nevertheless, it is interesting to note that twenty-two unpublished titles are listed on the attractive stationery of Edgar Rice Burroughs, Inc. Whether this was done with a view to publishing some of them at a later date, or merely to establish priority of ownership, is not known. The longest of these unpublished stories (125,000) words) is entitled: "Marcia of the Doorstep" (written in 1924). "Night of Terror"; "I See a New Race"; and "Came the War."